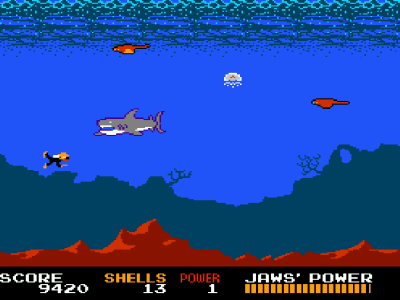 Like so many movie-based NES games, JAWS was unleashed onto Nintendo’s 8-bit console by the now-defunct, ill-remembered LJN. While JAWS is a superior game to most of LJN’s output, its utter monotony still makes it a completely forgettable experience. One could say JAWS is a sort of pseudo-RPG, as the whole point of the game is to build up your strength to the point that you can defeat JAWS. The game even features a world map and random battles, much in the way old-school RPGs did. The overworld sees players take their boat from one dock to another and back, over and over again. Going back and forth between two places would already make the game grow stale pretty quickly, but that’s only the beginning of the monotony. The point of the docks is that they’ll give you upgrades (such as a tracker to find JAWS easier), or boost your power so that you can actually put a dent in JAWS. The only problem is that these docks require you to gather shells for payment for these enhancements. This is where the random battles come in. As you make your way between docks, you may “hit something,” which initiates a sort of battle segment where your character (I don’t know which JAWS character they’re supposed to be) dives underwater to fight stingrays, jellyfish and smaller sharks. In these segments, you can move horizontally and vertically, and just keep shooting the sea life in hopes that they drop shells, all while avoiding getting hit, because if you get touched by an enemy once, you’re dead, and lose most of the shells you’ve collected. After three deaths, it’s game over. This is where things get downright frustrating. The stingrays and sharks swim horizontally, while the jellyfish swim vertically as they spawn form the bottom of the screen. What quickly becomes annoying is that the shells will fall from fallen enemies to the bottom of the screen, where they’ll disappear after about two seconds if you don’t collect them. Oftentimes a jellyfish might spawn right where a shell lands, and there’s nothing you can do about it. Similarly, some of the stingrays move much faster than others (with no visual distinction between them to let players know which ones are faster and slower), so if a shell falls towards the sides of the screen, you may be better off ignoring it, instead of risking a fast stingray spawning and immediately taking you out and robbing you of your shells. Another problem arrises with how the game fails to mention how many shells you need for the next upgrade or power boost. So you’re basically left guessing when you have enough, and if you don’t, you have to look for more random encounters and hope you can get enough shells out of it. You’ll run into JAWS himself rather frequently, though his encounters are signified with his fin appearing above the water, as opposed to being random (though with that said, he also swims into some of the regular encounters from time to time). While it is possible to some damage to JAWS early on, he heals in between encounters, which is why you need to boost your power enough so you can finish him off in one go. In between some battles, you’ll enter a bonus game (bizarrely referred to as an “extra scene”), in which you’re in a plane, dropping bombs at jellyfish in the sea (I am at a loss for words). The problem with these bonus segments is that they only control you have is dropping the bombs. The plane itself flies back and forth at its own speed, often at times when it’s impossible to hit any of the spawning jellyfish. As a whole, JAWS is far from the worst LJN game: The graphics are actually pretty decent, and it controls well enough, which is more than you can say about their Roger Rabbit or Bill & Ted adaptations. But there’s just so little to it, and you just repeat the same things over and over again to the point of madness. While the LJN catalogue may feature far more abysmal experiences, JAWS is a game that’s still swimming in all-too shallow of waters. Didn’t know that Jaws was made into a video game! Nice review.